In the past it has not been possible to critically audition and then encode multiple formats in real time within a host DAW environment. The revolutionary Sonnox Fraunhofer Pro-Codec Plug-In now makes this possible. We spend our professional lives making mixes sound as good as they can - and then hand them on for encoding and distribution. Later we often wish we could have made some improvements. In the past it has not been possible to critically audition and then encode multiple formats in real time within a host DAW environment. What if there was a way to audition and compare up to five audio codecs in real time? The revolutionary Sonnox Fraunhofer Pro-Codec Plug-In now makes this possible. 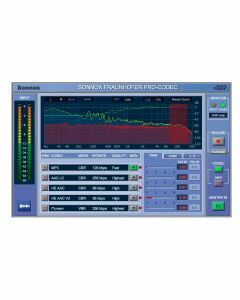 The Pro-Codec Plug-In is designed for the real-time auditioning of audio signals by the Fraunhofer codecs. The Plug-In also provides the ability to record the real-time encoded data to disk (in the form of MP3 and M4A files). This enables mixing engineers to produce compensated mixes optimised towards specific target codecs, thereby ensuring maximum fidelity. Similarly, mastering engineers may audition material in the final format, and produce compensated, optimised masters for final encoding and distribution. The included Pro-Codec Manager is a powerful desktop application designed for offline batch encoding, decoding and metadata editing of your encoded files.